Canadian Real Estate Breaking News – Regulations! Canadian Real Estate Breaking News – Regulations and then some! Well it has been and interesting start to the year in real estate, and February continued with more government interventions and changes to the regulations in both the lending and real estate industries. From increases in interest rates, more stringent financing qualifications (The Stress Tests), to dramatic slow downs in real estate in Toronto real estate to reductions in single family house prices in Greater Vancouver to an overall flatter real estate sales predicted across the country, these are certainly interesting times. As an investor it goes without saying that it is in our best interests to pay attention to those “market influencers” as Don Campbell of the Real Estate Investment Network discusses. The newly elected NDP Government in B.C. presented their 1st budget in parliament, which included a greater focus on the real estate sector than I have seen in the past. It is all detailed in the 2018 Homes for BC report here. Along with the provincial government’s new regulations there are changes in the real estate industry regulations, and not to be left out, the city of Vancouver requested that the provincial government to take two additional steps: a “flipping tax,” and new restrictions on foreign ownership. How will all these things affect the housing markets across the province? Is it too much to fast? Could it cool off the housing market in certain areas across the province too much? It will be interesting to see how this all flushes out over the coming months. 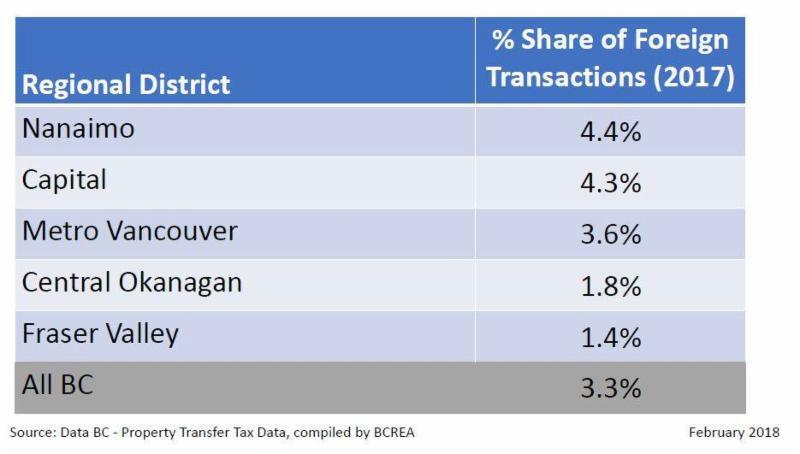 An immediate increase to the foreign buyer tax from 15% to 20%, and an expansion to Kamloops, Kelowna, Greater Victoria, Nanaimo and the Fraser Valley. A crackdown on fraud and tax evasion in the housing market, as well as a new 2% speculation tax on those who don’t pay income tax in B.C. The tax will be 0.5% in the first year, and go up to 2% in 2019. It is expected to bring in $87 million in first year and $200 million next year. A hike on the property transfer tax on Feb. 21 from 3% to 5% on properties worth more than $3 million, as well as an increase on school taxes. Spending $6.2 billion over 10 years to create 33,700 affordable housing units. And requiring the private sector being required to generate the remaining 80,300 units to meet the proposed 114,000 new affordable housing units. Phasing out the First Time Buyers Program. The NDP will be winding down the home partnership loan, which matched first time buyers with down payments up to 5%. Instead they will be creating a program called HousingHub which will partner with the non-profit sector to develop affordable housing. This is all good, so to speak, but what is still missing is how the provincial government is going to address the supply side, other than 3,370 new “affordable housing units” per year. That is a drop in the bucket of what is needed and this supply issue is as equally large a part of the housing affordability equation as demand. These are very broad strokes of the brush and there will be major consequences for transactions that are currently in play, such as pre-sales that could be significantly affected. The government will need to address specific circumstances that could have negative unintended consequences as the original implementation of the foreign buyers tax did. The concern over foreign buyers has been a hot topic in the media and may be overblown in the actual effect on affordability due to what these foreign buyers are actually acquiring. As we all know stats can be manipulated so some where in all of this lies the truth. There are articles that even say that the foreign buying by Chinese investors was known and was not acted upon, and now it has actually has already peaked. If there is money laundering in Vancouver as a recent Globe and Mail article suggests, then are any of these rules going to deter that type of activity? I don’t think so, as the criminal will always find a way around the law. As you may be aware the superintendent of Real Estate in BC has reacted to a few bad apples in the real estate sector and ended self regulation in 2016. Since then there have been changes within the industry to increase regulations, significantly greater disciplinary actions for violators, and greater fines for infractions. Except for the disclosure of agency representation, all disclosures must be in writing, be separate from any agreement giving effect to a trade in real estate, and, with the exception of the disclosure of certain types of remuneration, be separate from the service agreement or any other agreement under which real estate services are provided. Licensees may host open houses and provide general factual responses to consumers without providing this disclosure, unless a licensee receives or solicits confidential information from the party as part of these activities. This disclosure will inform consumers of the limited assistance that a licensee may provide to an unrepresented party as well as encourage consumers to seek independent professional advice. The Superintendent has added a new disclosure that licensees must make to seller clients for every offer that is presented. The Superintendent has created a rule to prohibit the practice of dual agency. Dual agency is when a licensee represents two or more parties with competing interests in a trade in real estate, such as both buyer and seller, or two or more competing buyers. Dual agency in under-served remote location. Before practicing dual agency under this exemption, a licensee must make a disclosure to both parties to the transaction, informing them of the duties and responsibilities of the licensee to the clients, and the risks associated with a dual agency relationship. The disclosure must include a signed statement by the brokerage explaining why the exemption applies. The signed disclosure must be provided to the Council promptly once the dual agency agreement is entered into. I am including these because as an buyer, seller, or investor implementation of the above items will definitely add paperwork and time to every transaction in BC and we need to be prepared for the extra workload to move deals forward. I am not sure if these rules will benefit the entire industry or resolve the issues of rogue agents that don’t abide by the rules and regulations, but it will certainly make it more involved for all agents.